I love honey in my beauty products. Seriously, give me a honey based cream, lotion or potion and I'm one happy chappy. It's a good thing then that this offering from British brand Bee Good is full of the golden goodness. The Bee Good Honey & Crambe Daily Hand Cream is pretty self explanatory really- it's a hand cream designed for daily use and has become part of my home office artillery. Since I've been growing my natural nails (hurrah) I've made much more of an effort to take care of my hands and tend to have tubes of hand cream in my handbag, next to the bed and in my office. The Bee Good hand cream lives on my desk and serves one distinct purpose- to pep up my hands and senses after I've spent hours typing away. The cream contains delicious ingredients including British Wild Flower Honey, Crambe Oil, British Beeswax, Borage Oil, Camelina Oil, Vitamin E and antibacterial British propolis. I actually had never heard of 'Crambe Oil' before I received this hand cream, but it turns out that it's rich in nourishing Omega 9 which is a fatty acid that smooths, conditions and provides a protective layer on the hands. In terms of texture, I've found that the trick with this is that a little goes a very long way- only a pea sized amount is needed for both hands. At first it feels quite slippery but then magically absorbs, leaving hands feeling soft, soothed and delicately scented. 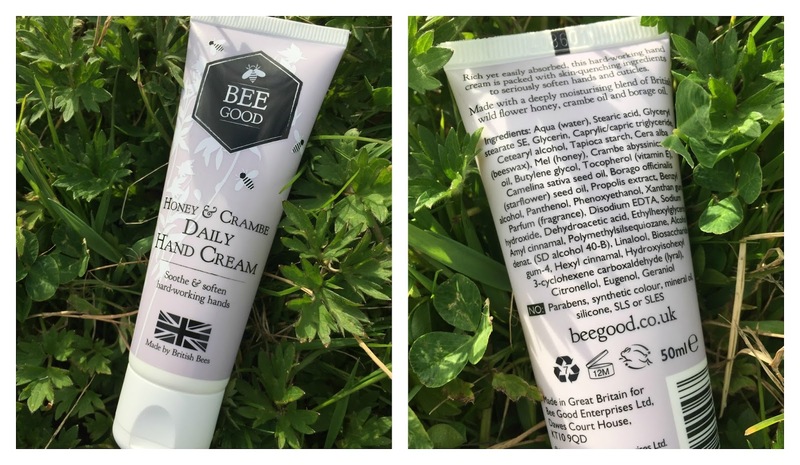 Bee Good Honey & Crambe Daily Hand Cream is £9 at Bee Good and you can find other Bee Good products at Look Fantastic.